My strength of field rating is a very strong 89% (same as last year). The entire top 50 players from the LPGA Priority List will be teeing up, as will 41 of the top 50 players from the current Rolex Rankings. Although my field rating loses a couple of points because this is not a full 144 player field, it more than makes up for it by including Bo-Mee Lee (#17 in the RR) and Jin Young Ko (#34 in the RR). Lydia Ko - Defending Champion and World's #1player. Ariya Jutanugarn - Number 2 and gaining fast. So Yeon Ryu - Number 3 in the Rolex Rankings and due to actually finish one. Brittany Lincicome - Playing well and has won this one twice already. Lexi Thompson - Always plays well here. Sung Hyun Park - Course fits her game, and she is overdue. 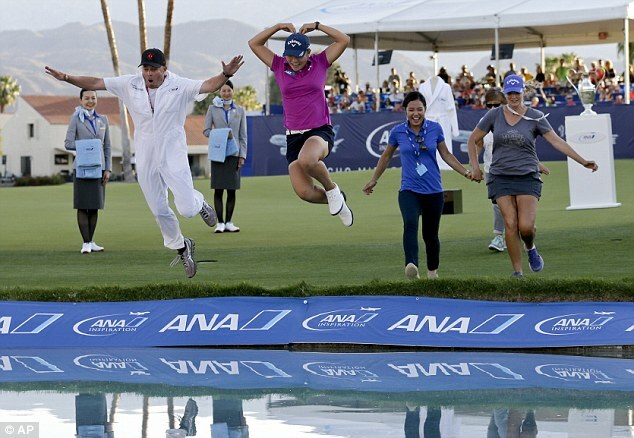 Ha Na Jang - Because she would be the first player to dance in Poppie's Pond. Jodi Ewart Shadoff - Has been playing well every week since mid 2016. Lydia Ko had her cut streak stopped at 40 straight. It was only the second cut that she has missed in her career. Amy Yang had her streak stopped at 37. The Kia Classic has been brutal to star players over the past few years, and that has been the case once again this year. Besides Ko and Amy Yang, huge stars Brooke Henderson (only her second MC as an LPGA member), Minjee Lee, Jessica Korda, and I.K. Kim also missed the cut. Sandra Gal, Hee Young Park, Mi Hyang Lee, and Lee-Anne Pace, all missed their first cut of the year. So Yeon Ryu makes the most important move this week jumping up from #5 to #3. Mirim Lee leaps from #21 to #14, while Austin Ernst vaults from #73 to #41. Ariya Jutanugarn leads with 949 points, she is followed by So Yeon Ryu (800), Ha Na Jang (791), Mirim Lee (725), Anna Nordqvist (679), and Brittany Lincicome (677). So Yeon Ryu has finished in the top seven in all four of her starts. Moriya Jutanugarn is the only player to finish in the top 20 in all six tournaments this year. Lydia Ko has been winless in her last 14 events. She has had just one top five over that period, and her #1 world ranking is now in jeopardy. Yani Tseng has missed the cut in all 4 tournaments that have had a cut this year. Danielle Kang has already missed 3 cuts this season. There are currently 10 active LPGA players with 10 or more wins. How many can you name?